L.A. Haunted Hayride 2014 Season Pass now on sale! The L.A. 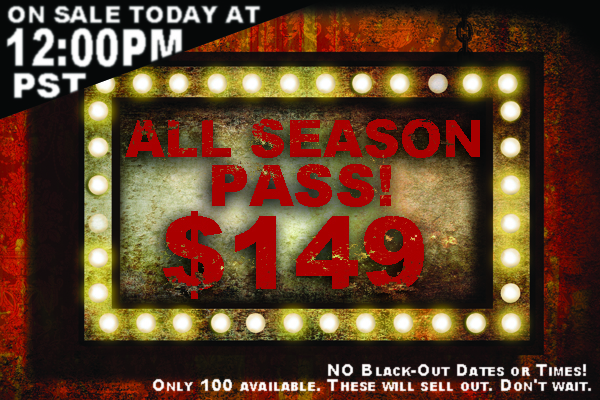 Haunted Hayride's All-Season Pass went on sale this afternoon. For $149, you get unlimited access through the Halloween season to all of the Haunted Hayride's attractions, with VIP status - and no blackout dates! Only 100 will be sold, so hurry! Purchase here. The Los Angeles Haunted Hayride is located at Griffith Park Old Zoo, 4730 Crystal Springs Avenue, Los Angeles, CA 90027. Dates for Halloween 2014 are October 3-5, 9-12, 16-19, 23-26, 29-31. There website is here.